Pro David Ohrn is your host instructor. Our philosophy is to "keep it simple" and not over-teach but to break the swing down to its simplest forms so students can understand precisely what they need to work on to improve their ball-striking and ultimately their scores. Regardless of your skill level, the Island West Golf Academy staff will help you get the most out of your game. You will lower your scores and increase your fun. Our staff will work with you and tailor a program to fit your needs. Island West Golf Academy offers a championship practice facility and putting green, practice bunker, all of which adjoin a Fuzzy Zoeller-designed 18-hole golf course. At Island West Golf Club, you will have fun and enjoy every round of golf you play. Schedule some lessons for yourself or your whole golfing party. 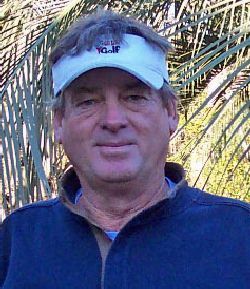 David Orhn and Brian Hughes are both PGA Professionals with over 40 years experience between them. They are committed to helping every golfer improve your game with instruction tailored to fit your needs.